Chips are a lovely thing to have. Perfect to complete a fish finger and beans meal. The perfect thing to accompany burgers if you indeed need, or want, something else. They make fish and chips well, fish and chips. And dead simple to make. I have entertained the notion of buying a deep fat fryer. But there is something that holds me back. It is in part the smell that lingers having fried something in a deep fat bath. No matter how much of an extractor fan one has, or how many windows one opens, there seems to be a fatty smell that permeates for days after a deep frying session. However I understand that a deep fat fryer with a lid does minimise these issues. But there is also the quantities of fat there will be hanging around between frying sessions. I just don't think that I make enough prawn crackers or wontons to make a deep fat fryer a necessary part of my cullinary equipment. 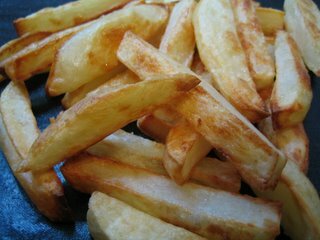 The good news is that in order to make chips one is not necessarily required to deep fry the potatoes. The perfect cripsness and bite of a double fried chip is traded off for the convenience, and it must be said, safety, of a thoroughly delicious oven baked chip. Peel and slice some potatoes into chip shapes. I find floury ones make the best chips. Soak the chips in cold water for at least half an hour. Drain and dry the chips in a tea towel while you preheat a solid baking sheet in a 200°C oven. Either toss the dry chips in a little olive oil or spray with olive oil. Spread the chips out on the sheet and bake for half an hour, turning over and rearranging a couple of times. Sprinkle with salt and enjoy with your favourite ketchup or even just by themselves.